Steve Bannon has thrown his support behind a private effort to pay for a wall along the southern US border, amid a political impasse that has held up $5.7 billion in funding for President Trump's signature campaign promise, according to Politico. Bannon and Kolfage are joined by several other "#MAGA all-stars," as Politico describes them, including Blackwater founder Erik Prince, Kansas Secretary of State Kris Kobach, former Colorado Rep. Tom Tancredo, former Sheriff David Clarke and baseball legend Curt Schilling. The group has formed the nonprofit group "We Build the Wall" which emerged from the original crowdfunding effort. According to Kolfage, President Trump reportedly blessed the project in a conversation last month with Kobach, while the organizers insist that they can plan a large-scale wall project which could supplement and trim the cost of Trump's federal wall. "Look, it’s evolving," said Bannon. Bannon added that they are studying whether the wall can be created from hemp-based building material "hempcrete" - a bio-composite material comprised of extraordinarily durable hemp hurds and lime. The material is lightweight and semi-flexible. "Do you understand the irony of using hempcrete to keep out marijuana?" asked Bannon, rhetorically. If hempcrete is selected for the project, Kansas-based America's Hemp Academy would be tapped to supply the wall material, according to organizers. Detractors, such as National Immigration Forum Executive Director Ali Noorani, have called the project "a great political stunt," but warned that "it's not going to make the country safer. Noorani suggested that border security resources should be applied to ports of entry. That said, a the private effort would require the consent of private landowners instead of government seizure - something Noorani admitted was an advantage. Around 2/3 of the 2,000 mile southern border - or around 1,300 miles, is owned privately or by states according to a 2015 report by the Government Accountability Office. "They have the right to be skeptics," said Kolfage, a triple amputee Iraq war veteran. "It's something that's never been done, and it’s a very big project, but we're going to give it our all." According to Kolfage, citing experts, they could break ground by May or June - which he suspects would result in more fundraising as the group demonstrates that the project is actually happening. "Once we break ground, it's going to open up a whole new can of worms." "Oftentimes people will just wait for the government to do it," Kobach said. "In this case the need is so urgent that they say they want to do it right now." 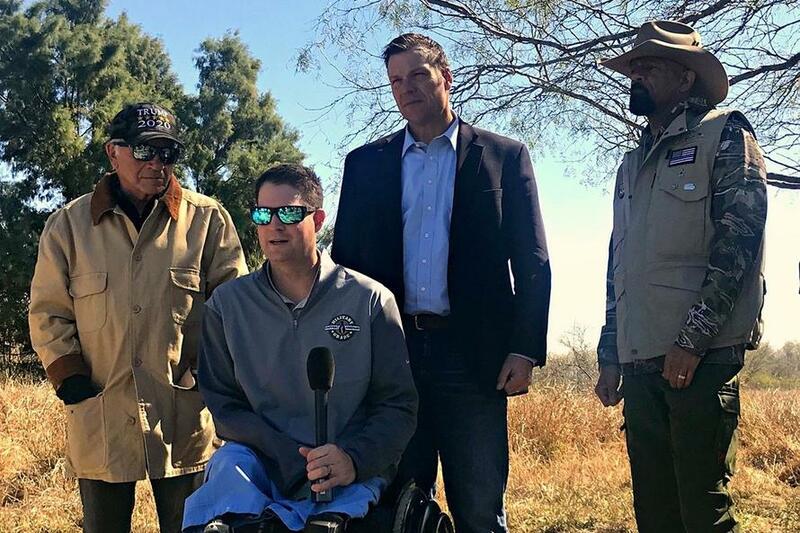 Bannon joined the group after Kolfage made headlines when Facebook shut down the disabled veteran's Facebook pages. Kolfage turned to the former Breitbart chairman, and the two hit it off - meeting in Washington for meetings about the wall project in late December.